I was in my daughter's school last Friday when I came across a story more frightening than The Omen, The Exorcist or Anne Curtis' singing. I was told the Aquino administration is dead set on adding 2 more years to high school. From all appearances, there's probably a greater chance of Aquino growing more hair than his changing his mind about this. Sadly, only beautiful women can say no to Aquino. His cabinet members and the entire nation must follow his bidding, or else thou shalt be impeached, fired or humiliated during public speeches. Our only comfort is in making fun of his sparsely adorned scalp. Hooray for Philippine democracy. My brothers, sister and I each only completed 16 years of school but I remember my mom had to pay blood and sweat for every single year. She sold everything from sandwiches to magic beans to send us to school. If she could ride a unicycle she would have if someone paid her to do it. I only have one kid in school now but every time I get the monthly school statement of accounts, my vision starts to dim, I go partially deaf, and I start speaking gibberish. My fellow parents and I call this the tuition fee syndrome. It's not just the cost of sending kids to school that's the issue though. They've adjusted the recommended ages for the grade levels too. If kids should ideally be 5 years old when they graduate from Kinder 2, that means Kinder 1 kids should be 4 years old. Kids optionally sent to Nursery class for socialization and skills preparation have to be 3 years old. Toddler classes then will have to accept 1 to 2 year olds. My youngest will be three years old in a couple of months and he can't talk, thinks everything is edible, still drops little odor-filled pellet surprises when he forgets what the potty is for and thinks he's the Batman. If my kid had to take an entrance exam now for admission in his current state, I know I'd be the first to cry. Even if admission tests and requirements are scaled down so young kids can pass, parents will still have to pack milk bottles, diapers, baby wipes and teddy bears along with the usual cookies and juice for their kids. That's just another way of saying small kids aren't ready. Aquino says the Philippines is one of the few countries with just 4 years of high school. We need to add 2 more years to improve the quality of education. Don't we have highly respected Filipino nurses, doctors, educators, chefs and engineers thriving in foreign environments abroad? Aren't these people the products of four year high school programs? It's not in the number of years. It's in the quality of education and in the way we teach kids how to deal with the realities of life. Are you ready for school little boy? Only if they teach me my ABCs in the Batcave. To the Batcave! Ugh! gamay nalang gyud! I'm close to cursing the guy! Thank God I didn't vote for him! Now those who voted for him because they believed in CHANGE, o here it is! Change na gyud! I don't know though if this is making ur lives easier :P.
He is practically making it even harder for parents to send their kids to school! Okay ra unta if tuition fees are decreasing each year while salary is increasing pod. Sadly it's the other way around! haynaku PNoy maypag mobuto ka! there I said it! lol! I love your pretty funny sarcastic, rhetoric criticism style of writing! i was laughing hard and almost forget the seriousness of this issue. well i need not add to the fire. there's a pros and cons, so we just have to weigh it based on the factors now and not the past. i'm a product of only a few years of education and a teacher at 18 and a lawyer at 22, but will not make that as a basis for saying the additional year is just nonsense. Quoting: "I only have one kid in school now but every time I get the monthly school statement of accounts, my vision starts to dim, I go partially deaf, and I start speaking gibberish." Oh, this made me crack!! LOL! I was actually reading your post aloud to my husband. Well, you know what's more funny? He likes the idea of this K12 education system. But you know, you're right! That only means more expenses and more vision getting dim, going partially deaf and going gibberish for parents! How's that! I just hope that yeah, Aquino will grow his hair on this decision and mind thinking of scholarships or ways on how to let unfortunates go studying. Thanks for the share! 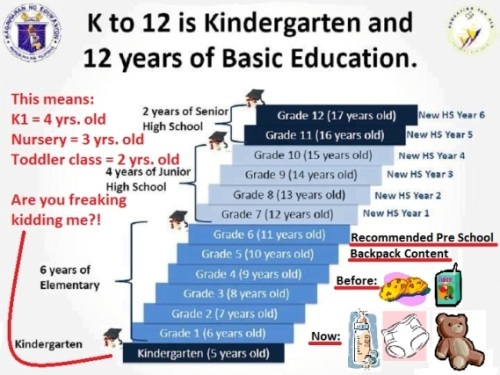 I don't have kids so the effects of K-12 have not sink in much but I feel that it's not in the number of years but in the quality of the education. I don't even think kindergarten is needed. I have a 4-year old kid and i feel your sentiments. "Don't we have highly respected Filipino nurses, doctors, educators, chefs and engineers thriving in foreign environments abroad? Aren't these people the products of four year high school programs? It's not in the number of years. It's in the quality of education and in the way we teach kids how to deal with the realities of life." <---- very true! I respect all of what you've stated here. That's your opinion. Sooner or later you'll know why the government is doing that. Actually sir, despite appearances, I know why the government is doing this and I realize the value. The point of this post is to illustrate the fact that parents and children are not ready for this. I do not pretend to present a complete picture here, just the concerns of a hard working mother who can barely make ends meet in these difficult times. omg. ang taaaaggaaaalll! sama mo pa College. dang! oa na masyado. yes, the cost and the readiness of the kids are real issues but right now I will only focus on the readiness and worry about the financial aspect later (prayer can move mountains). I have a 3 yrs & 9 months old daughter and last month she was not ready...not at all! But I sent her to summer school for nursery and lo and behold, she may qualify for Kinder when school opens. We are having her tutored at home and so far so good! So think positive and hope for the best. Well, the K+12 program needs a lot of infrastructure to make it worthwhile. I.e. more classrooms, more experienced teachers, and smaller class size. I think decongesting the curriculum into more years rather than cramming so much content in less years is more valuable to students. It will likely get retained more. However, I'm not sure if by the end of the basic education program that they are ready for employment. The training has to be very solid and they need to work with the private sector to make this part successful. honestly, I'm not in favor of this program.. I studied in a school with prep 1, 2 and 3.. add the 6 yrs in grade school and 4 yrs in high school.. total of 13 yrs na.. and now they added one year more? paying for their children's tuition is no joke for every parents..
Hi Chris. Sure you can reblog this but please, please make sure you let your readers know that this is by no means a complete picture of K+12... This is just my opinion as a working parent. There are many, many advantages to the program that I did not touch on. "It's not in the number of years. It's in the quality of education..."
I completely agree with this. And from what I've been watching, reading, and hearing from the news, I think the government is not even ready to implement this K+12 or whatever that's called. I just don't want to see a whole class of students trying to learn their lessons under the mango tree. It's better to have quality education than quantity education. definitely affect a large number of complaining class CDE in the society. Philippines has only 4 years high school but believe me ,i have been to middleest and now in US where my son spent her school years(Phils .Qatar,US).All i can say is we(Phils)is the best and cannot be beat when it comes to teaching. our school system is way way ahead than any other country with 6 years high school curriculum .So I don't see any reason why do they have to change it .Unless they make all the education free make it compulsary for all parents to enroll their kids to public school.